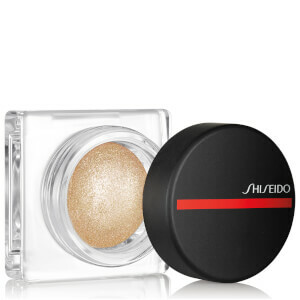 Add dimension to your facial features with the Shiseido Aura Dew; a multifunctional highlighter that transforms and illuminates skin with a breathable, weightless formula that lasts for up to 12 hours. Arriving in several shades inspired by Tokyo’s gleaming lights, the formula is spiked with ultra-fine, light-refracting Japanese pearlescent filters in a cushiony, transparent base that melds seamlessly with every skin tone. Powered by Clarity Matrix, the enhancing highlighter contains cutting edge Silicone Polymers and film formers that promote longevity without caking. Draw attention to your eyes, lips, or cheeks without compromising colour or adding weight for an enhanced radiance.